Dolphine (Onyx)Dimension: H-4 Inches Approx.This hand carved statue/figurine of Dolphin, made o.. This hand carved statue/figurine of Dolphin, made of Onyx stone, is believed to provide you the cumulative benefits of both, a Dolphin statue and the Onyx stone simultaneously, in almost all aspects of your personal or professional life, in both senses the worldly and spiritual. · Dolphin is one of the prominent lucky charms which believed to provide the protection and symbolise good luck, happiness, and wit. It represents resurrection, harmonious relationship and balance in both the materialistic and spiritual well-being. · In Feng shui tradition as well, Dolphins are considered very lucky and believe to bring in lots of fortune and positive chi (Energy) into the house or office premise. · Onyx symbolises protection and strength. Onyx is powerful protection stone which deflects negative energy and helps to prevent the drain of personal energy. Onyx aids the development of emotional and physical strength and stamina, especially when support is needed during times of stress. It also fosters wise decision making. Onyx also relates to affection, friendship, and love. 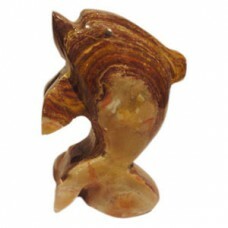 · Introducing figurine of dolphin, made of onyx stone, as a beautiful home décor item will be a clever way to catch positive energies while enhancing the aesthetic appeal of the house/office. · It is a preferred choice to gift your near dear loved ones and professional associates.